LAKEVILLE, IN. – It was the toughest ticket in town! 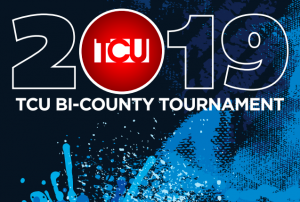 What was a meeting between administrators about the future of county basketball tournaments, turned into what has become the 54th Annual TCU Bi-County Basketball Tournament. Back in the day, county basketball tournaments was the place to be. The small school thrived and basketball was king as neighboring schools packed local gyms on cold, winter nights. Then, as consolidation of school districts began to take shape, those county tournaments turned into 4-way tournaments. That’s when a group of administrators met and began to etch out a plan for a larger tournament. We sat down with longtime LaVille athletic director Dale Cox to find out more about how the Bi-County Tournament took shape. According to Cox, at the beginning, it was a boy’s varsity tournament to start. His memory was a little shaded, but recalled that they strung the tournament out so it would last. He thought maybe the course was Tuesday, Wednesday, Friday, and Saturday. At the beginning, it was an eight-team event that included Argos, Bremen, Culver, LaVille, New Carlisle, North Liberty, Triton, and Tyner. LaVille would host the entire tournament. The first boy’s tournament crowned a champion in 1966. North Liberty, coached by Bob Gowin, led his club to a thrilling 56-54 victory over Triton. Tickets, at that time, were sold as all-tournament tickets. There were no single-game tickets. And, at the time, LaVille’s gym was sectioned off into Section A, B, C, D, E, and F. Section G was at the west end of the gym, while section H was at the east end as portable bleachers were brought in to help accommodate fan interest. In fact, since the tournament used to be single-elimination, if a team lost, folks were waiting in the parking lot to find out which team was eliminated and fans of the eliminated school would sell to those still involved that wanted tickets. “Basketball was king back then,” said Cox. “There were people outside waiting to see who lost and that couldn’t get an initial ticket. According to Cox, tickets were printed by section, row, and seat number. Cox gym currently seats 2,968. When the portable bleachers were brought in at the east end of the gym, the capacity could very easily approached 3,100. Glenn 14, Bremen 12, Argos 7, Triton 5, LaVille 5, New Prairie 3, Oregon-Davis 3, Culver Military Academy 2, Culver Community 1, North Libery 1, Culver High School 0, New Carlisle 0, Tyner 0, Walkerton 0.